The :target pseudo selector in CSS matches when the hash in the URL and the id of an element are the same. The current hash of the URL is "voters"
While that URL is as it is, that section element will have a yellow background, as per our CSS. One possibility is when you want style with "states." When the page has a certain hash, it's in that state. It's not quite as versatile as manipulating class names (since there can only be one and it can only be related to one element) but it's similar. Anything you could do changing a class to change state you could do when the element is in :target. For instance: change colors, change position, change images, hide/show things, whatever. We'll touch on all these things in this article. How do you get hashes in URLs? Regardless if it's a same-page link or not, the browser behavior is the scroll the page until that element is at the top of the page. Or, as far as it can if it can't scroll that far. This is rather important to know, because it means exploiting this "stated" behavior is a bit tricky/limited. For instance, I once tried a variety of techniques to replicate functional CSS tabs, but ultimately decided using the checkbox hack was a better idea because it avoids the page-jumping issues. Ian Hansson at CSS Science has some examples of tabs as well. His third example uses :target, and absolutely positioned elements hidden above the top of the page to prevent page jumping behavior. It's clever, but not really a solution, because that would mean the page would jump upwards should the tabs be down further on a page. The anchors are actually fixed position, meaning they scroll with the page and don't exhibit top-jumping behavior. Extra clever! Here's a problem: When a hash-link sends you flying down the page to the relevant section, it will try and make that section snug against the top of the browser window. But what if there isn't enough room to scroll beneath that section? That section will be visible, but it won't be snug against the top, which can be weird and confusing. I'm not just making that up. From personal experience, page-jumping links that don't take me to somewhere where was I was linking to is exactly on the top, I get all out of sorts. I find it happens all to often on things like FAQ pages where the linked-to sections often aren't very tall. One historical method was called the Yellow Fade Technique. It was employed by 37 signals in situations where new content is added to the page, and they were trying to draw the user's attention to it. Jonathan Snook ported that idea to CSS and combined it with :target. When the sections become in :target, the scoot over to the right a bit via translateX transform (prevents any weird text wrapping or anything we might get with padding) and a red border flashes on via keyframe animation. That's all there is too it really. I'd chalk this up under progressive enhancement, if you're worried about browser support. As in, it's just a nice touch, not vital. Let's say you like the idea of using :target for states but dislike the page jumping behavior, you can change the hash link in a URL without a page jump. Using jQuery, you could target all hash-links, prevent their default behavior, and use pushState (or replaceState, I suppose) to change the URL (which won't move the page). You could interchangeably use replaceState there too, which would change the URL without adding an entry to the browser history. Sometimes you might want that, sometimes you might not. At least you have a choice here, which you don't with the default behavior of clicking a hash link, which always adds. When the URL changes to a new hash, you'd think the current target would change and new CSS would take effect. It doesn't (tested current WebKit and Firefox at time of this writing). It's a bug. 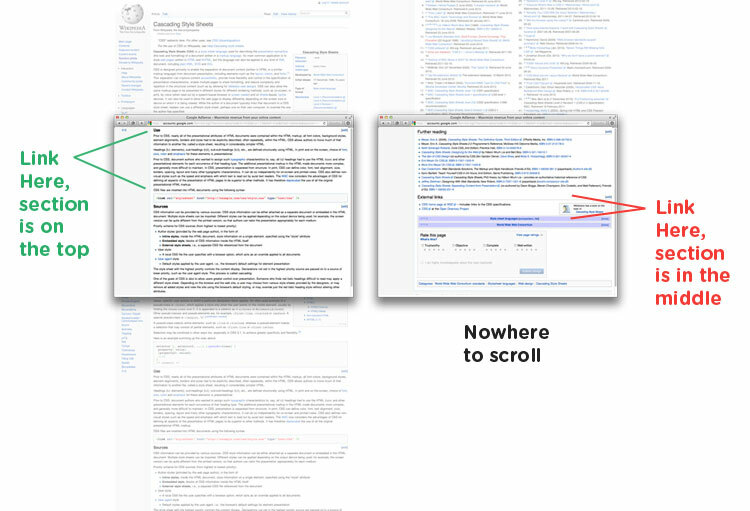 Theoretically, you could measure and save the current scroll position of the page, let the link move it naturally, then set it back to where it was. But that just sounds so awful I couldn't even bring myself to make a test page for it. Demo of yellow fade technique (although for existing content, not newly-added content) from Web Designer Notebook. A CSS Target, literally, by Caleb Ogden. Missing the usual mention of browser compatibility found in your other articles. When is it safe to use this technique and does it degrade gracefully? off topic: i like your photos. With regards the CSS Science tabs example, wouldn’t giving the hidden elements “position: fixed;” solve the jumping issue as they’d always be in the viewport then? clevvvvver. Try making a demo? I’m confused – isn’t the CSS Science page already using “position:fixed;” for the third example? There is no jumping as far as I can tell. Ah yes, on inspecting his example the spans are in fact using “position: fixed;”. Wait, doesn’t that bug render the use of the pushState/replaceState technique practically unusable for now (and perhaps while bugged versions of those browsers persist)? Err, though according to the bug report using location.hash does work, though I’m not exactly clear on the difference between that and pushState or replaceState at the moment. I saw a jQuery plugin not too long ago that made it so when you came from another website to the example page with a #hash in the link, it would stop the auto “throw you down the page instantly” thing and it would instead smoothly scroll from the top of the page down to that element. So people coming from different websites, clicking on a link that leads to the middle of the page in your website will be more oriented. It didn’t really work though, it seemed to jump anyways. I’m wondering if anyone would know how to go about doing that with jQuery (the right way). I think you might have touched on something like that in this article but I’m not very great at jQuery so I wouldn’t know. I’ve never seen anyone do this “right”, maybe it’s not really worth it though? Another variation: I recently did a small demo using :target to hide content “off canvas” on smaller devices. See http://sandbox.webpro.nl/css3/adaptive-layout-pattern-off-canvas-variation.html (use small width to see it in effect). Funny, I did something yesterday that abuses the :target selector excessively. I recommend viewing it in Opera, as in my tests it was the only browser to support transitions on transform: scaleY. I’d always wondered what it did exactly. Now my mind is replete with monstrous creations that use the :target selector! I played with :target few month ago on http://creativejuiz.fr/trytotry/juizy-slideshow-full-css3-html5/ and I used the general siblings CSS selector combined to the :target pseudo-class in a “hidden” element (see the source). It works! No jump! In the article you mention that mine, the one on csscience, wouldn’t work if the tabs were further down the page. The objects which are selected with :target have position fixed though, so that wouldn’t make a difference. I’ve purposely made the page long so you can scroll down a bit and check. That’s flipping cool. Really useful for blogs and knowledge bases really. This tutorial is interesting, this is using css animation, what I know is not all browser are support with css animation, but I like it, are its ok if using css animation? Haven’t done a great deal of testing on it, and of course it crashes and burns in the usual browsers, but always fun to experiment. So happy I came across this script, I was a day or two away from adding a bunch of target links to a site i’ve been working on and this method will make the end result sickkk. I’ve create an experiment with you technique, let’s see this ! I played with :target a little after reading this post. Works great except on older IE, of course. I’ve used the :target pseudo-class a few different times in projects that were for modern browsers. Most recently, I’ve actually used it to create CSS-only accordions. Granted, I know that jQuery can accomplish accordions, and that HTML5 has summary and details. But summaryand details doesn’t have wide browser support, while :target is pretty much IE9 and all modern browsers. So, if you find yourself in a situation where the very large corporate client doesn’t want you using JS libraries, but they’re ok with CSS3 (yes, it happened to me) it’s an approach worth considering. I wrote a blog post on the approach. Instead of pushState/replaceState, using location.hash and location.replace to update the hash, respectively. These mechanisms will reevaluate the CSS correctly, bypassing the WebKit/Gecko bugs. Ugh, nevermind—it is not a solution to Fight the Jump. Sorry Chris! I was toying with the idea of non-JS pop-up (a friend at work asked if that’s possible) and, while working on it, I stumbled upon your text here. I’ve read that jumping of scrolling is unavoidable and it made me sad, but then I started trying to do that anyway. Eventually I came with the solution and it can be seen here: http://laboratorium.krazov.com/css-pop-up/. It has its flaws, of course, but that was just for fun.